Unlike many other coffee professionals, I consider dosing and distribution a unit, since the distribution of most of the coffee bed is determined during dosing. A barista's goal when dosing and distributing should be to provide every shot with a dose of identical mass and evenly distributed volume and density. 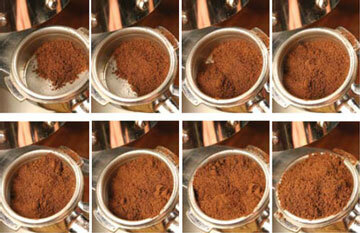 Dose size variation leads to inconsistent flow rates, and uneven distribution causes uneven extraction. Perhaps the single most important skill a barista can have is to be able to consistently create an evenly distributed coffee bed. Distribution starts as soon as dosing begins, so it is critical to dose with careful aim. The following is one example of a dosing system. Unlatch the portafilter from the espresso machine. Knock out the spent puck. Wipe the inside of the portafilter basket with a dry rag; moisture on the side of the basket can promote channeling around the edges of the coffee bed. Ensure all of the basket holes are clear. Turn on the grinder. If you have a very slow grinder, you may turn on the grinder as the first step. Pull the handle repeatedly while rotating the portafilter so that the grounds fill the basket as evenly as possible. If more grounds fall into one section than another, the favored section will be more compacted, even after grooming. Turn off the grinder when the proper amount has been ground. Stop dosing when the desired amount is in the basket. This amount can be exactly the amount used for extraction, or it can be a little more, with the extra grounds removed during grooming. Whatever amount you choose, it is important to consistently dose the same amount every shot. No matter what dosing method you use, it is easier to get a uniform distribution by sprinkling a small dose with each pull of the handle than by dumping large amounts of grounds with each pull. A couple of common dosing methods are efficient enough to use in a busy café. The pie piece method. Think of the coffee bed as a pie cut into several wedgeshaped pieces. As you dose, fill each "pie piece" to the rim of the basket, rotate the portafilter and fill in the adjacent piece, rotate and fill again, and so on. The layering method. Sprinkle small amounts around the basket while continually rotating it to form a shallow, even layer of grounds. Repeat the process to build a second layer on top of the first. Continue stacking layers until the desired dose is in the basket.